Beggars All: Reformation And Apologetics: Luther "did not have to wait long to see the havoc his ideas would unleash"
Luther "did not have to wait long to see the havoc his ideas would unleash"
There are two specific Luther quotes provided, both said to be from "Msgr. Patrick F. O’Hare, 'The Facts about Luther', Tan Publishing, 1916." Though not provided, the page in question from Father O'Hare can be found here. Let's take a look at these quotes and see if they support the conclusions of this defender of Rome. "The people feel they are free from the bonds and fetters of the Pope, but now they want to get rid also of the gospel and of all the laws of God." This first quote was translated into English in LW 60:149-150, Preface to Ambrosius Moibanus, The Glorious Commision of Jesus Christ, Our Lord and Savior (Mark 16 [:15]). This preface was written in 1537 for a work against schwärmer (enthusiasts) that were emphasizing the inner work of the Holy Spirit at the expense of the sacraments (LW 60:147-149). I have no doubt that the Last Day is not far away, though the highly intelligent and super-rational world is not concerned about this, being are that there is no need for that for a long time. As time goes on it is becoming so callous and wicked that, even if no Last Day were supposed to come, still it itself—highly intelligent reason—would have to say that it may not and cannot continue or remain this way for long; rather, either a flood must take place or else what happened to Sodom as an example, if it is really true that there is a God who punishes injustice. Innumerable examples of this are manifest since the beginning of the world and are still before our eyes every day, if only reason, so highly intelligent and so profoundly blind, could see such horrible punishment and would allow itself to be moved thereby. It is an old saying, repeated by many teachers, that after the revelation of the Antichrist the people will become so dissolute that they will thereafter be unwilling to know or to believe anything about any god. Rather, each one will do or not do according to his own pleasure, as the devil and the flesh teach. We see such a time being fulfilled here before our eyes. For now that the horrible, dreadful lies and deception of the abominable Antichrist, the papacy, have been revealed and come to the light of day through God's amazing and exceptional grace, the people are beginning to believe nothing at all any longer. And because they feel freed and released from the bonds and strictures of the papacy, they want to be released and freed from the Gospel and all of God's commandments as well. From now on whatever pleases them and seems good is to be good and right By rights, this will be the end of the song, if God so wills. [LW 60:149-150]. As the first sentence from Luther's pen demonstrates, in his mind, it was the end times. For Luther, it was the end of the world. Things were indeed going to get worse. The Gospel was going to be fought against by the Devil with all his might. The true church was a tiny flock in a battle against the world, the flesh, and the Devil. He hoped the people would improve with the preaching of the Gospel, he often admitted he knew things were going to get worse because of the Gospel, which is exactly what this context demonstrates. The second quote states, "if we succeed in expelling one devil, he immediately is replace by seven other who are much worse. We can then expect that after having driven away the monks, we shall see arise a race seven time worse than the former." It is documented by Father O'Hare as "Erl. XXXVI, 411." This page can be found here. O'Hare is wrong with his documentation. 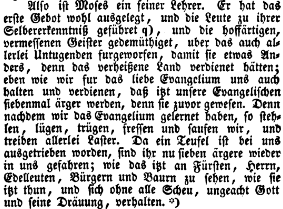 True, this German text above does say something like, "if we succeed in expelling one devil, he immediately is replace by seven other who are much worse," but it does not say, " We can then expect that after having driven away the monks, we shall see arise a race seven time worse than the former." I believe the reason for this discrepancy is that O'Hare mis-documented the quote. He may have had either a Table Talk statement in mind or Luther's comments on Galatians 5:13 (LW 27:50) from 1535 (or some other source!). The quote certainly is not from Erl. XXXVI, 411 as O'Hare states. How it standeth with the Christian Church. IT standeth with the Christian church, no otherwise than with a, silly sheep, which the wolf already hath catched by the wool to devour it. Our nobility, our gentry, citizens, etc. will not hear aright, they think (when we preach the Gospel, and reprove the Papists concerning their confidence in works) that as then we preach of good and easy days, and, that they have leave now to live, and to do what and how they please. O, they sin too highly, insomuch that if we drive out one devil, then there come seven others in his stead. If we should drive away all these Friars, then other, seven times worse than these, would come [Table Talk]. The overall argument from this Roman Catholic blogger is too big in its scope: he blames one sixteenth century person for just about... everything at the expense of Luther's point in his own time period. For Luther, it wasn't his teaching that caused "havoc," but rather he thought it was the devil responding to the pure preaching of the Gospel causing havoc. This Roman blogger thinks these quotes demonstrate Luther was lamenting over "the havoc his ideas would unleash." If there is a lament, it was not a lament of sorrow for his teaching or seeking the reform of the church. Rather, it was a lament over the work of Satan against the tiny flock (the true church). One other thing does jump out from this little context exploration: this educated Roman Catholic blogger may have never actually read these quotes in their immediate context, their historical context, or with any sort of attempt in keeping Luther's theological framework in view. 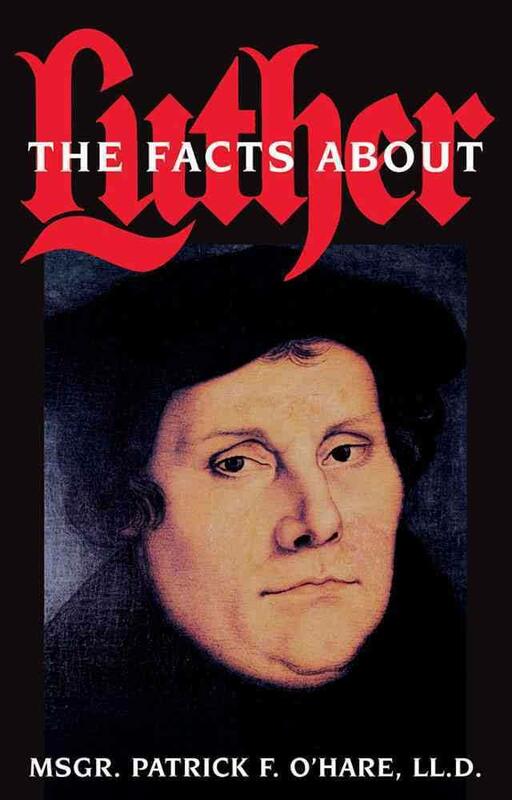 Using Patrick O'Hare's The Facts About Luther typically leads far away from the actual facts about Luther. I give you Luther’s own assessments. The source is The Walch edition of “Luther’s Own Works” which was published by Gebauer, Halle, in 24 volumes, between 1740 and 1753. The work was carried on under the supervision of Professor D. Johann Georg Walch, of Jena. Beware of someone in English claiming they've pulled quotes from an eighteenth century source written in German and Latin. There's no need to go to such obscure out-of-print sources when there are modern editions of Luther's Works readily available.